Brussels Sprouts is probably the most polarizing vegetable. You either love it or hate it and I personally love it. 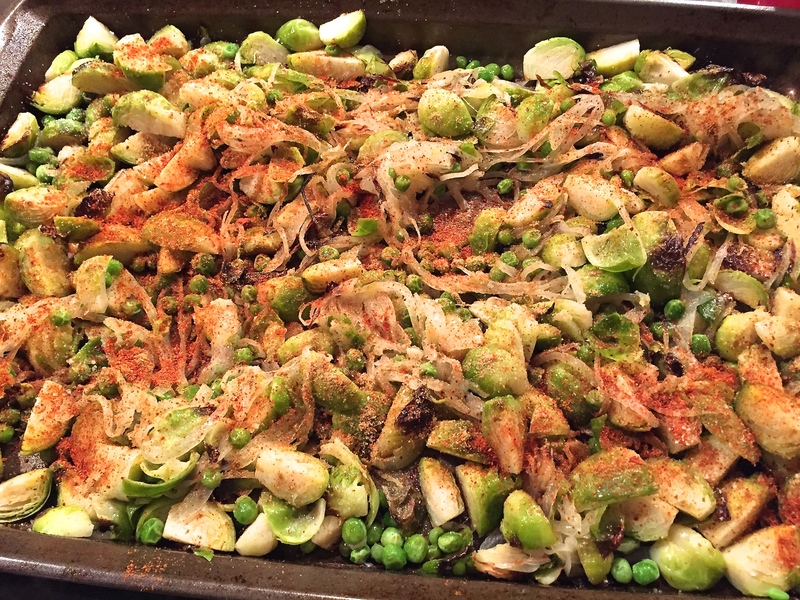 I also think if you dislike brussels sprouts, you just haven’t tried this recipe yet. This roasted version with caramelized onions and peas is a perfect way to enjoy this unfairly judged veggie. Spray a roasting pan generously with non stick cooking spray. 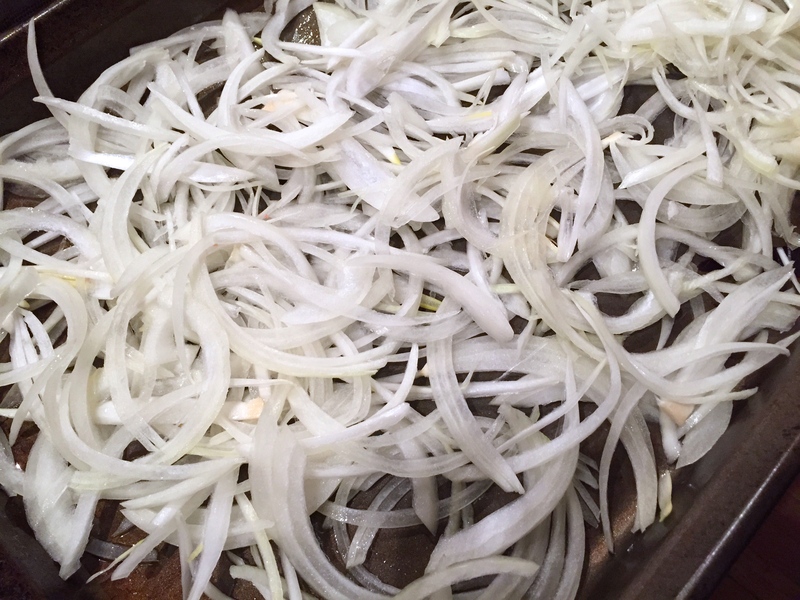 Spread the sliced onions evenly and bake for 8 minutes. The onions will be slightly softened and translucent. 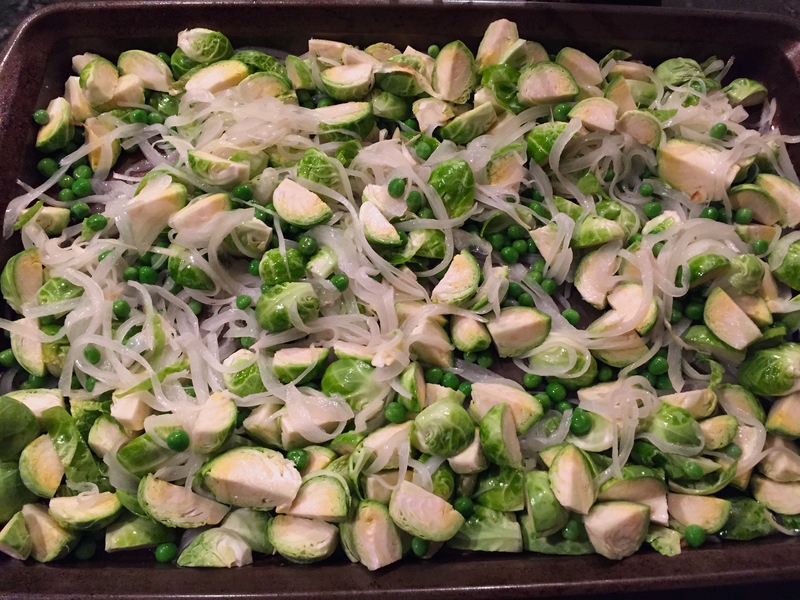 To this, add the chopped brussels sprouts and peas. Drizzle 3 tbsps oil over this, with 2 tsp of salt. Toss together until all the veggies are coated with oil and the salt spreads evenly. Put this back in the oven and roast for about 25 minutes. Take the pan out, add the cumin, coriander, and red chilli powder, along with another 1/2 tsp salt(if needed). The veggies should have completely cooked through by this time. They will be soft, with just a few pieces becoming crispy. Toss all the veggies and spices together and return this to the oven. Roast for another 15 minutes, or until the sprouts are crispy and golden brown. The onions will be caramelized and the peas slightly crispy but soft on the inside. I love eating this with some simply salted yogurt dolloped on top. These also make perfect side dishes served with dhal and steamed rice.